Citrus Catering & Events: The Foodie Blog: What's for Dinner?? It seems like Fall has finally arrived to our beloved city. While the North East is being pummeled by the first snow storms of the season we are freezing in our perfectly sunny skies and 60 degree weather. Go figure! What can I say; you get spoiled by the heat! Nevertheless, the fall season is all about delicious hearty soups, stews and other comfort foods. 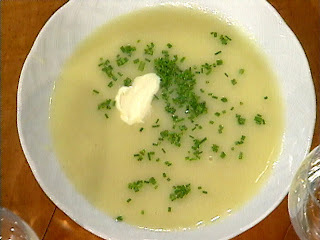 So, what better way to kick off the 'cold' than with one of my favorite soups, Julia Child's Leek and Potato soup. Optional: sour cream, crème fraiche, or heavy cream and a small bundle of chives, chopped. In a heavy-bottomed saucepan bring the leeks, potatoes and water to a boil. Season lightly, cover partially, and simmer for 20 or 30 minutes, or until the vegetables are tender. Puree with an immersion blender directly in the pot or transfer to a blender to puree to a smooth consistently. Serving au Naturel – Don’t puree, just ladle out the soup as is with whole cooked vegetables and top each serving with a dollop of sour cream and chives. Cream of Leek and Potato Soup – Use a cup less liquid when simmering the soup. After pureeing, whisk 2/3 cup or more of sour cream, heavy cream or crème fraiche into the soup, simmering a moment to blend. This is a quick and easy recipe that will really hit the spot and make you feel all warm and cozy. Enjoy! We'll see you back here on Monday for "Monday funday". Have a yumtastic weekend!